For me today was all about pushing the kilometres. I essentially have two days to walk close to 70 km and get out to State Highway 94 to be able to hitch into Te Anau for my last resupply of this trip. Do the maths and its easy to see that two days of 35 km are very feasible. My main issue with this strategy however was pushing 35 km on day two would get me out to the road late in the day and I wanted to leave plenty of time for a hitch to town. I was keen to reach the road on day two at around 2:30-3pm, so I resolved to push as much distance as I could today. I was fully expecting to do a 12 hour day today but as it turned out I got 41 km kilometres in, in around 9.5 hours. That was enough and my feet were sore. We were all keen to get an early start today and were up getting ready in the dark. Nadine and Philippe left right on first light just after 7am and I followed shortly after. There was just enough day light to make out the orange trail markers in amongst tussocks. Walking at first light is always great. So nice watching the early morning sun rise over the hills and spill sunlight into the valleys. Colours are always so vibrant during this time. The wind was down, the air settled and noise travelled easily across the land. I love hearing the waking calls of birds carry through the air and the crunch of my foot steps on gravel underfoot. 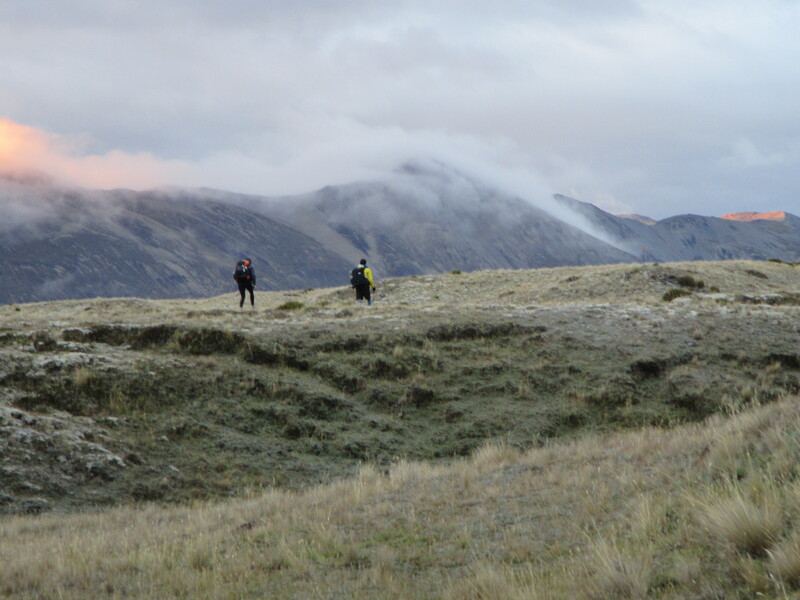 From the hut, the Mavora Walkway followed through smaller tussocks which was great, moving over rolling hills all morning towards Boundary Hut. There were a few small gullies to get down to and climb back up but for the most part the walking was straight forward and easy. Approaching Boundary Hut, the hut itself could be seen from quite a way off but the trail seemed to move away from it. It actually follows around to a swing-bridge over the Mararoa River. I got a bit impatient with this, picking a more direct line straight across to the hut. On sight it looked easier but required me to push through head high tussocks and ford the river. The river was deceptive. With such clear water it was difficult to gauge the depth. It looked ok and was as I started to push through, though I soon found myself in hip deep water and a saturated lower half. Bugger. Never mind. I would dry enough with a little sun and wind. I briefly stopped at the hut to sign into the intentions book and moved in, meeting Nadine and Philippe as they crossed the swing bridge. I’d overtaken them earlier on the track as we played leap frog for a while. 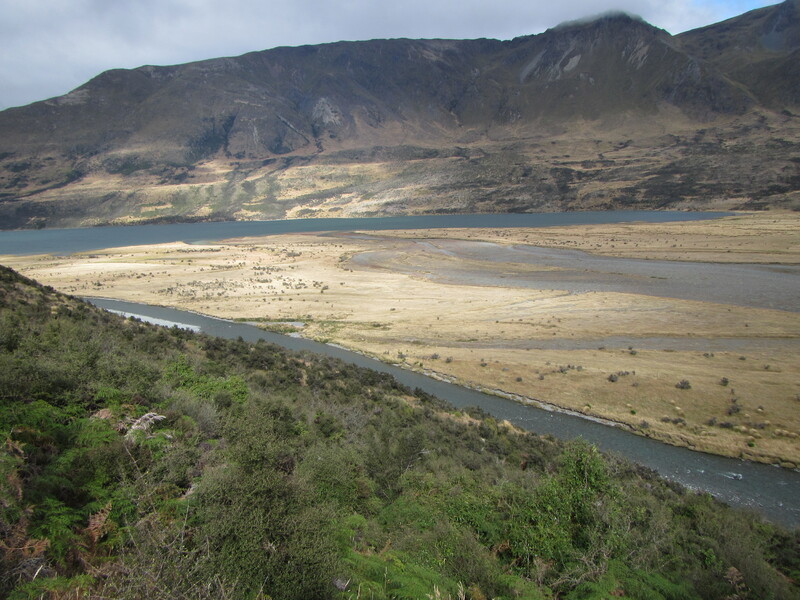 From Boundary Hut the trail shifted onto an old 4wd track all the way to Mavora Lake and beyond. It was fast walking but boring. I got my ipod cranking, rocking some of my favourite tunes to get the pace up and push some miles. 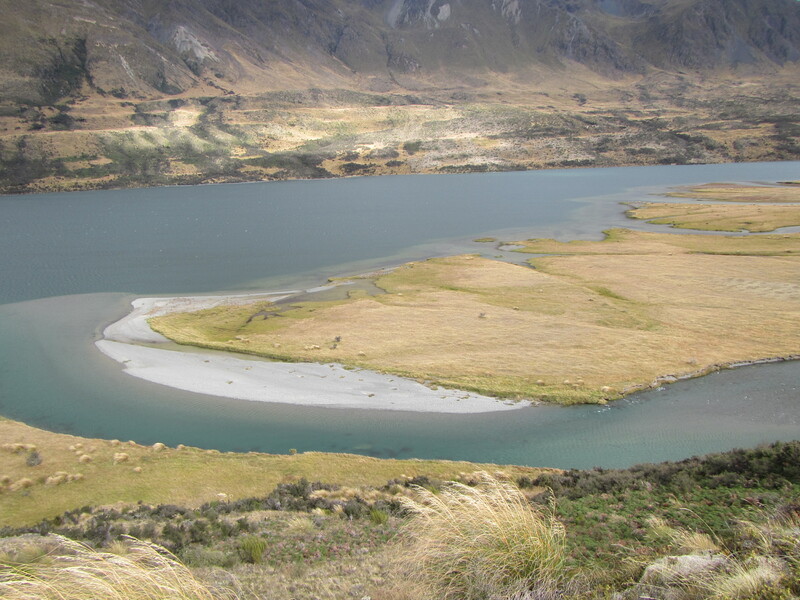 There were some great views down towards the Mavora Lake and the braids of the Mararoa River as it feeds into the lake. Pressing on, I reached Careys Hut on the banks of the lake for some morning tea, close to 18 kilometres completed for the day. Reading through the hut log it looks like POD, Disco, Solenne & Antoine stayed here last night and are a half day ahead. It would be great to catch these guys and travel to the end at Bluff with them. Heres hoping. 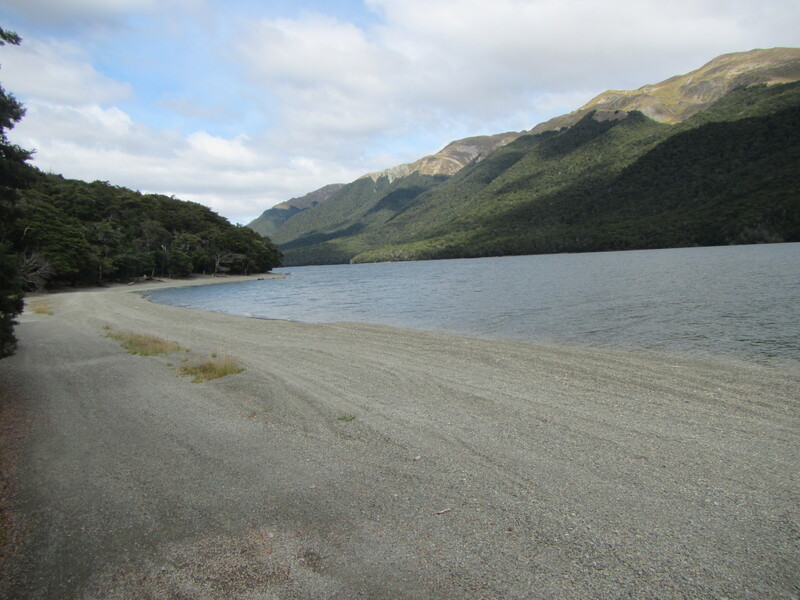 The 4wd track continued right through to the Mavora Camping area, popular with car campers. I was surprised by the amount of water and deep pools on the 4wd track itself. With wet feet already I didnt have to worry about trying to skirt them and plowed straight through. 7 km of 4wd track from Careys Hut I reached a nice area of beech trees on the bank of the lake and stopped for some lunch. But it was a quick one with sandflies harassing the hell out of me. I still had quite a way to walk today anyway so a short lunch wasnt too bad. Only a few kilometres on and the trail passed through the camping area. A big sprawling area of grass and patches of beech trees. There were quite a few RV’s and car campers set up. 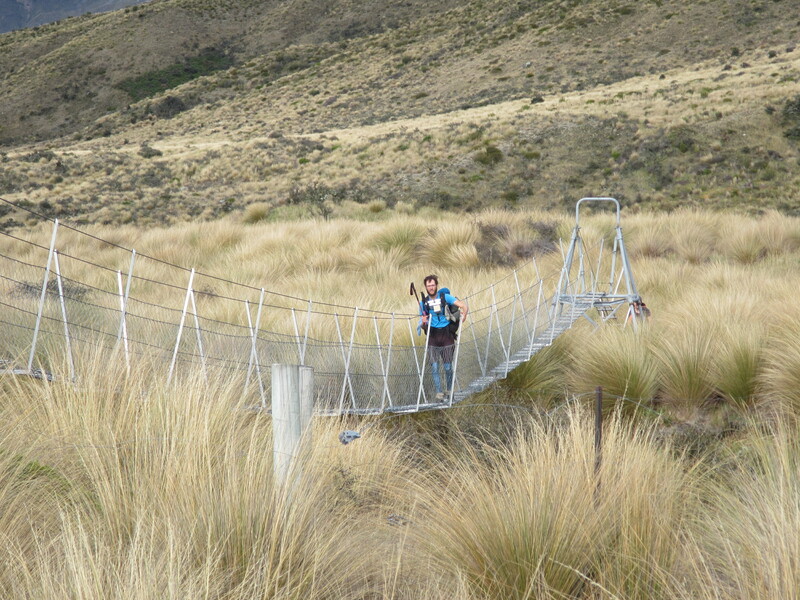 Following the southern bank of the northern lake it was over a swing bridge and on towards South Mavora Lake. 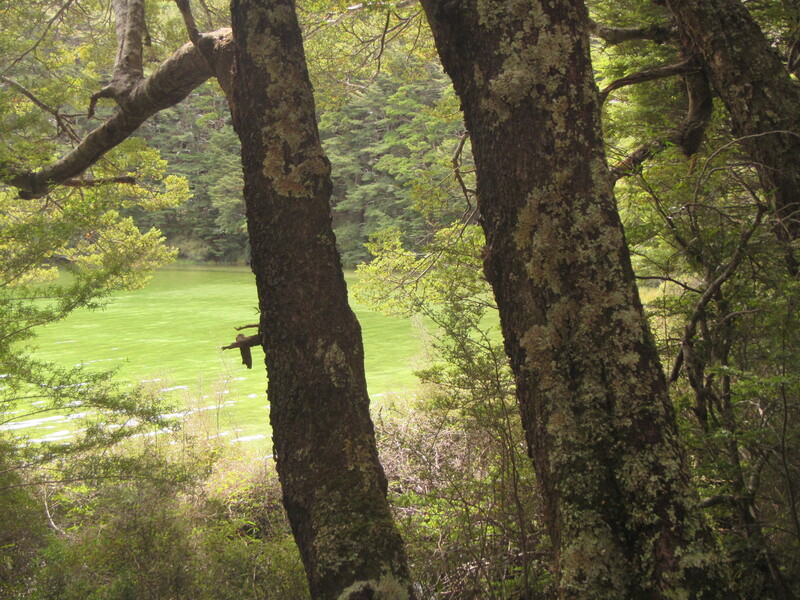 For the rest of the day I pushed on another 14 kilometres of trail through beech forest following the western bank of South Mavora Lake to swing-bridge number 3. It was close to 4:30 – 5pm, I cant quite remember, but I was beat. Doing the maths, I’d travelled 41 km and was satisfied with a good days work. That would leave me around 29 kilometres to get in tomorrow to get to the main road by the early afternoon and hitch into Te Anau, easily achievable. I surprised myself with the mileage and time, thinking I would easily be putting in a 12 hour today but it wasn’t to be. Just near the swing bridge was a nice informal camp site, sheltered in amongst the beech trees and overlooking the river. A DOC toilet was located on the other side of the swing-bridge and plenty of water available from the river, although it does run through farm land and I filtered it to be on the safe side. A nice camp site.